Vanessa A. Ryan picked the perfect background for a murder mystery in Santa Fe: rich people, not-so rich artists, and crime and corruption in the city’s art world. First, some relevant local data: In the Santa Fe Reporter’s 2013-14 Annual Manual, the city’s population was given as 68,642 residents. The more recent Manual didn’t give us the population number, but both editions say that the City Different has four art galleries per 1,000 residents. That’s a lot of art. After city government, it’s the primary business in town, aside from tourism. Santa Fe is ranked the number one city for air quality in the country, and has 320 days of sunshine a year, which may be part of the reason it’s the fourth happiest city. I’ll second that. Music and dancing and general festivity are a way of life. The downside? The cost of living in Santa Fe is 17.7% higher than the national average. Maybe that’s why it’s not the happiest city. But without all those wealthy people, the art scene would die. It’s a necessary symbiosis—and central to this story. Insurance administrator Lana Davis comes to Santa Fe looking for the beneficiary of a life insurance policy. As soon as she starts her search, the plot gets complicated. I can find my way around Santa Fe’s oddly configured streets without a map, but I couldn’t figure out whodunit. 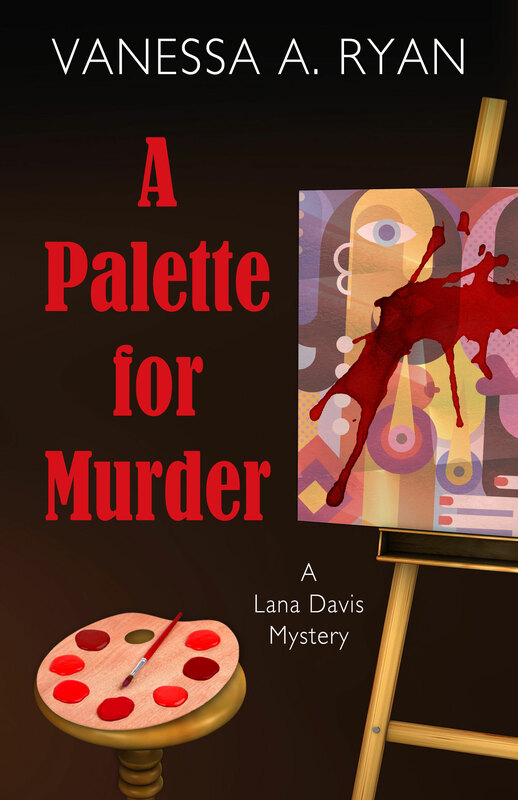 This is a classic puzzle type of murder mystery. Everyone’s a suspect, and I mean, everyone. The behind-the-scenes look at an art gallery was intriguing. A lot of the little details—how important it is to some people to be invited to a benefit auction, the way rich people can tell who’s really one of them but poor artists can’t, and even snobbery about fauxdobe—also give the book an “insider” feel. Lana is an amusing narrator. She’s basically good but willing to bend rules just enough to take some risks she shouldn’t take, and she’s cool enough not to get as freaked out by death, danger and violence as most people would. If she were an animal, she’d be a cat: independent, self-sufficient, and persistent and clever in the chase. She has nine lives, too, and is good at landing on her feet—at least figuratively. This makes her a good fit for the amateur sleuth role—the personality has to be believable for the premise of the amateur investigator to work. More sensitive or rule-following folks wouldn’t dare get into the situations she does. I think there are two kinds of series protagonists: the ones we identify with, and the ones we would like to be for a day. Lana is the second kind. Ryan is a polished story-teller. If you like tight plotting, a great setting and a fast pace, this is your book. 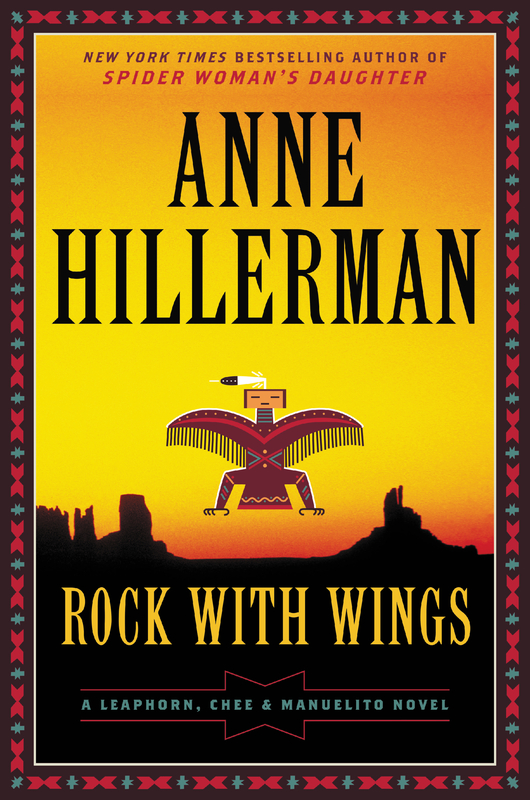 Last week I reviewed Rock with Wings by Anne Hillerman. She is an award-winning reporter, the author of several non-fiction books, and the daughter of New York Times bestselling author Tony Hillerman. 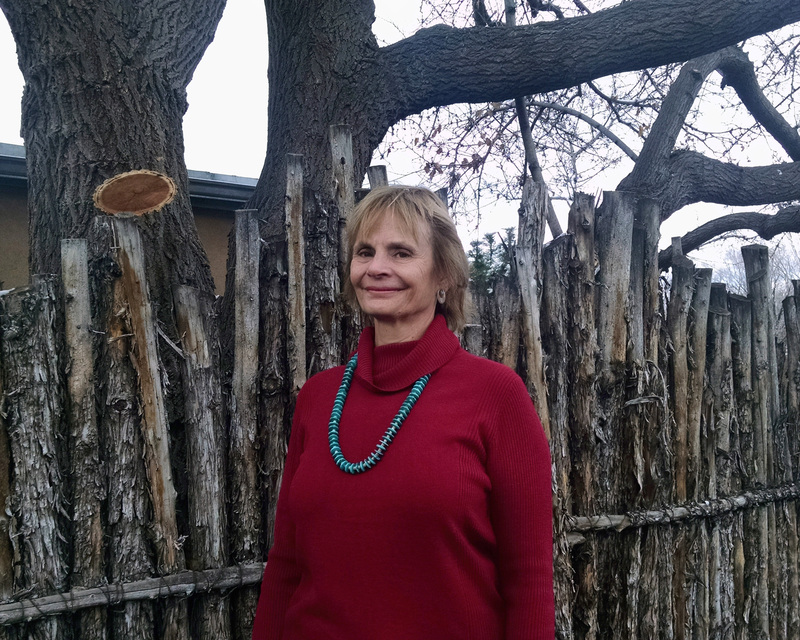 She lives in Santa Fe, and this is her second novel. This week I’m delighted to have her as my guest for an interview. AF: I appreciate the Navajo glossary in the back of Rock with Wings. I’ve heard the language spoken, and I cannot begin to reproduce the sounds even when I know a word and what it means. Do you speak Navajo? AH: Just a very few words. AF: Which language do Chee and Bernie speak at home? Do they slip back and forth—English and Navajo for different kinds of topics? AH: Yes, they slip back and forth—English when they are talking about work and financial discussions; Navajo for more important matters of the heart. AF: One of things I enjoy in your books is the way you portray family and friendships. Several years ago I read your father’s wonderfully titled autobiography, Seldom Disappointed, and I recall that you grew up in a large family. Remind me how many siblings. AH: I have two sisters and three brothers. AF: Would you say this has affected your writing? In what way? AH I believe almost everything you experience in life helps you in some way as a writer (and a person, for that matter), although you may not realize its value at the time. Growing up as the big sister to such a diverse group of siblings helped me learn how to negotiate and compromise—skills I later discovered I needed in the world of commercial publishing. Also, because we were a busy, lively household, I learned how to focus despite chaos. The amazing and unexpected things that happen in a large family certainly honed my sense of humor. And, of course, the diverse personalities I shared dinner with each night might have given me ideas for a few characters. AF: You’ve attended citizens’ police academies and learned from members of the Navajo Nation police and other police forces in northern New Mexico. What are some of the most surprising things they taught you? The most useful for you as a writer? AH: The most surprising, and most useful too, was their absolute willingness to let an outsider civilian like me into the club. I was humbled by the openness of the officers I spoke with who shared their insights into both law enforcement and human nature. I was swept away by their passion for and commitment to their work, especially officers who were involved with the very difficult assignments relating to domestic violence. I never appreciated the dichotomy in basic police work, where officers can go from static boredom to high adrenalin situations in a matter of seconds. I enjoyed learning about technology used in law enforcement but getting some insight into how cops size up suspects, witnesses, and victims and how they can usually tell when people are lying helped me even more. AF: Both your books are set in June, the hot windy time before the rains. Are you one of those people who loves the windy season? AH: No, no, no. Wind is not my friend! It makes me restless, stirs up the pollen from the juniper trees that surround my Santa Fe house, and rolls the tumbleweeds across the highways, creating traffic trouble. I used June as a setting in both those books because it’s a season of suspense here in the dry Southwest. Temperatures spike in June. If we’re lucky, late June eventually and after much anticipation and broken promises, brings the start of summer rain. AF: Do you have a favorite time of year, and what makes it special in your part of the world? AH: I enjoy the change of seasons and Santa Fe is great for that. I love the transition from winter to spring, the discovery of those early hyacinths in my garden when the nights are still way below freezing, and the way daffodils survive April snow and keep smiling. Summer’s long days and beautiful crimson sunsets remind me of why our mountains, the Sangre de Cristos and the Sandias, are named for blood and watermelon. I enjoy the contrast between summer days in the 90s and nights cool enough to require a blanket. July’s dramatic thunderstorms, usually more sound and light than moisture, sometimes create enough rain to turn the arroyos into running streams. Fall brings more eye-popping contrasts, the brilliant yellow of the shimmering aspen leaves against the deep blue sky. Crisp days scented with apples and pungent smoke of pinon and cedar in the fireplace—and a big pot of green chile simmering for dinner. I love winter, too. Unlike many places, Santa Fe seldom goes two days in a row without sun. I love the diamond sparkle of fresh snow, the quiet discovery of rabbit and bird tracks along the road, and those crystal-clear winter nights with millions of stars, each with a story to tell. AF: Tell me about your favorite trading post, roadside restaurant, or other out-of-the way place in the Four Corners Region that most people might not have heard of. AH: So many places, I hardly know where to start, but I’ll give it a try. I love the old trading post at Toadlena, N.M. with its beautiful setting at the base of the mountains. The owners and the staff reflect an attitude of hospitality that’s hard to beat. I always try to stop at Teec Nos Pos, N.M. and the Keems Canyon, Az. trading posts when I’m out that way. They always have some surprises. The Hubble Trading Post in Ganado, Arizona always makes me smile. I try to talk advantage of tours to visit the Hubble home when I’m there. It’s like a step into the past. I enjoy the Tuba City Trading Post (also in Arizona) with its wonderful collection of books, and the Code Talker Museum that shares the building. Across the walk is another of my favorite places, Navajo Interactive Museum. It’s filled with wonderful exhibits and videos in which the Navajo people tell their own history starting with their creation stories. I love to stop for lunch at Earl’s on old Route 66 in Gallup, N.M. The food good, and you can shop while you eat because the restaurant invites native artists sell their jewelry, pottery, sculpture, etc. from table to table. I like the restaurant at the Quality Inn in Window Rock (AZ) with its sweet little patio garden, and the eclectic food at The Junction in Chinle (AZ). AF: In continuing the series your father wrote, you’ve mastered the inner worlds of Bernie Manuelito and Jim Chee, and I found the glimpse into the workings of Joe Leaphorn’s mind in his little notebook in Spider Woman’s Daughter strangely touching—the intimacy of the ordinary. That orderly little book, without an emotional or private word in it, often just numbers and sketches, still made me think you knew him inside-out. Do you plan to use him as a point-of-view character in the future? AH: Yes. I’m looking forward to writing about him. He was the character my Dad loved best, and I needed a few novels under my belt before venturing into his complex mind. AF: What was the greatest challenge in making the transition from writing nonfiction to writing fiction? How has your earlier background helped you as a novelist? AH: For Spider Woman’s Daughter, my greatest challenge was making the little voice that kept telling me “you’re not Tony Hillerman” understand that I could continue the series without being my Dad. That some changes and my own voice would be OK as long as I was true to the spirit of his work. I knew there were many, many people who loved Dad’s work and would be highly skeptical of a new kid taking on his characters. I’ve been touched and humbled by the notes I’ve received from many of them, telling me they were glad to see their favorite Navajo detective back on the job. The research I did for the non-fiction book I wrote about Dad and his work, Tony Hillerman’s Landscape, On the Road with Chee and Leaphorn, was enormously helpful. I didn’t realize when I wrote it that I would write a novel, but it paved the way. That book gave me an excuse to re-read all of Dad’s novels closely and to travel to places he loved in Navajoland and elsewhere in our beautiful Southwest. Also, because I had completed book-length manuscripts before, I know what to expect in terms of time commitment on a big project. Having dealt with New York editors before, I had some insight into the business end of publishing. All that helped with the transition. AF: I particularly liked the role of certain plants in Rock with Wings. One of your nonfiction books is on the Gardens of Santa Fe. Your protagonist Bernie Manuelito is interested in plants; she studied botany in college. I’m looking for the roots, pardon the pun, of this synchronicity. AH: I loved writing Gardens of Santa Fe and the gardeners I interviewed taught me to appreciate plants in a new way. Luckily for me, Dad had established and developed Bernie’s interest in botany and the natural world in several of his novels. I’m glad he did, because it gave me a nice hook for Rock with Wings. The little cactus I mention is real, by the way, and actually is an endangered species. AF: Some writers start with a plan, others improvise, and some work with a blend of structure and free play. Tell me about your process of creating a story. AH: For me, it’s a conglomeration of trying to plan, trying to be organized and efficient, and listening to inspiration when it comes, even if it means major revisions. With Spider Woman’s Daughter, I was guided by the knowledge that Bernadette Manuelito needed to solve the crime and that the crime had to be a big deal. I knew I wanted to use Chaco Canyon as one of my settings, so that led me to consider a plot that involved archaeology. Archaeology in turn, led me to use Santa Fe as another setting because the city is filled with museums stuffed with artifacts, and I knew it would provide a nice contrast to the rural reservation substations and to isolated Chaco Canyon. In Rock with Wings, I wanted to build on Bernie’s interest in plants. Then, I decided to take the reader to Monument Valley, a beautiful setting Dad never used. The story grew from there. AF: The colorful supporting characters give so much life to your stories. Do these characters just show up? Do they surprise you? Do you intentionally build them? AH: I’d like to stretch the truth and say I’m smart enough to build my supporting cast based on a long-range plan for the series, but, mostly, they just show up. A couple minor characters in Spider Woman’s Daughter come back in Rock with Wings. AF: Do you have an idea for the setting of your next book? AH: Yes. I think it will open at a big basketball game in Shiprock, and then move to Tuba City, an interesting town on the border of Hopiland and a good place to stop on the way to the Grand Canyon. The Grand Canyon may get in there, too. AF: Thank you for such thoughtful answers. I look forward to the next book.